Passion, Brilliance, Joy, Entertainment ! Photo by Donatella Parasini click on image for her beautiful website. Dream State Circus are innovators of new world entertainment, this amazing duo have broken the mould so many times there is constant anticipation for what is coming next. Their unique skill set and extensive worldwide, first hand, hands on experience have helped keep their dreams and goals intimate, positive and accessible. Dream State Circus' passion to bring light into the eyes and smiles to the faces of all they chance upon, has driven this duo to present more than 3000 shows in some 38 countries over the last 15 years. 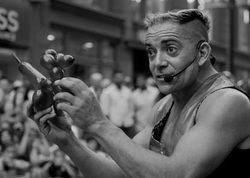 Dream State Circus have received many international awards for their work. From the back stage casinos of Glastonbury to busking circle-shows in the streets of Bangkok, from the war-torn refugee camps of Myanmar and the mirror-lined ball rooms of Ritz-Carlton Singapore, the atriums of Princess cruise liners to the poverty stricken primary schools of Costa Rica, there really is no preconceived box that can contain this captivating duo. 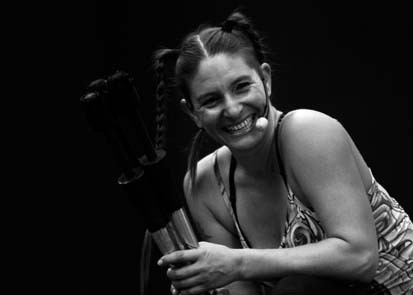 Bountiful motivation is responsible for Dream State Circus' professionalism and expertise in so many areas, the joy of discovery and creation has lead them to such a diverse range of skills. Festival performances & venue performances, using the circus skill set we train and love, including fire dance poi, clubs, hoop, double and single staff, ropes, whips, acrobalance, juggling, partner club juggling with fire and knives, equilibrium, balancing boards, ropes, aerial trapeze, comedy and more. Event design and delivery, venue design and delivery, large-scale spectaculars, motorised parade floats, specialised props and set design and fabrication, rigging and scaffolding, design and installation of aerial rigs, A.V. Collective professional presentations, structured and open workshops, school workshops in circus and craft, shows and student presentations or parades, ethically sound and environmentally conscious practices. Life has been an amazing journey and only made possible by Dream State Circus' love and passion for the most accessible, non-discriminative art of street performance and improvisational comedy. ​A big thank you to each person who has donated, supported or booked us without which none of the above would have been possible ! "I'm a strong believer that what we can achieve is only limited by our imaginations. It takes a keen ability to visualise ones dreams, not just as a whole but how every piece fits together, from this mind map we have a build plan, so lets build dreams!" "I am eternally grateful for this life, for this amazing adventure we are constantly creating on this beautiful planet; full of inspiring, incredible beings and places. We can all dream a dream, so lets dream a good one for everyone !"